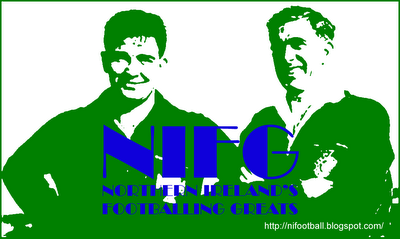 Representative Honours: Ireland: 1 Full Cap (1949); Irish League: 3 Caps (1949); USA: 1 Full Cap (1953). Club Honours: Irish League Champion 1950/51; Irish Cup Winner 1950/51, Runner-Up 1948/49; City Cup Winner 1950/51; Ulster Cup Winner 1950/51. Goalkeeper Cecil Moore made his debut in the 1945-46 season, aged 19 and made a total of 23 appearances that term. The following year he played just 11 times but one of those games was a crushing 9-0 defeat to Belfast Celtic, a result that equaled Glentoran Football Club’s worst ever defeat! 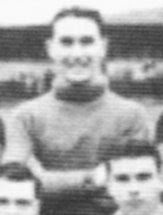 The next couple of years saw Cecil become the regular keeper and he played alongside such Northern Ireland legends as Blanchflower, Bingham and Peacock during their time with the Glens. In 1949 Cecil Moore played in the Irish Cup final against Derry City, a game that the Glens lost 3-1. He was also on the losing side later that year as Glentoran went ‘Back to the Oval’ but the following year was to be one of success for both Moore and the club. Despite losing the Gold Cup final to the old enemy the Glens were crowned League Champions for the first time in 20 years. They also picked up the Ulster Cup, City Cup and the Irish Cup - beating Ballymena Utd 3-1 in the final. Cecil Moore played 50 games in goal that season, bringing his total appearances to 181. He was awarded a benefit game in May 1952 with Glentoran drawing 1-1 with Luton Town. Cecil Moore was capped in 1949. The game, played on 9th March, was against Wales and was played at Windsor Park. Moore was beaten twice (by Edwards & Ford) as the visitors won 2-0. Cecil Moore moved to America in the early-1950s. In June 1953 when the USA faced England in New York the Daily Express reported: "The label "America" looks strange for the U.S. team with such performers as Terry Springthorpe (Wolves), Cecil Moore (Glenavon [sic]), Roy Milner [sic] (Glasgow Celtic), and a nicely varied forward line of America, Germany, Greece, Scotland, and Peru." So it seems likely that Moore joined the ranks of Ireland's dual internationals. With thanks to Cris Freddi for supplying the extract from the Daily Express.